Hello everyone. We hope the beginning of 2018 has been great for you, and we’re sorry for the lack of updates to social media. We’ve been busy here, pushing out numerous small updates for Reverse Lookup and Reverse Lookup PLUS, the latest of which is beginning to roll out now and will probably be complete by the end of next week. Looking forward, we’re currently working on an update that contains a feature we’ve been getting a ton of requests for. We’ll leave you with that teaser for now, but it shouldn’t be very long before we’re able to push that to all of you. Later in the year, we’ll be updating the app to run on the latest Android runtime versions.. this is a background change and probably won’t affect your usage very much, but it’s a step that’s sorely overdue and will make things easier for us moving forward. We do have one other big plan for the year, and that’s to experiment with what could be one of the biggest single features we’ve ever included. We’re not sure if it’s really feasible so no promises or hints on that yet, but we’ll update when we can. In addition to all of this, you can look forward to the usual small bug fixes and also background updates to our service that we’ve always done. As always, thanks again for using the app, and feel free to reach out if you have comments, questions, or any other type of feedback. As we prepare to celebrate Christmas, we’d like to take a brief moment to wish you and your loved ones a safe and happy holiday season. As always, thank you to all of our users for another great year, and we look forward to serving you even better in 2018. Hey everyone, we’ve resolved the earlier issues with the new update for Reverse Lookup and have continued our rollout on the Google Play Store. Everyone should have it by Christmas barring any unexpected issues. Have a great weekend! Hey everyone – small update. We’re seeing a new crash introduced in this latest update, so we’ve halted it for now. We’re working on a fix and expect to resume rollout by this weekend. If you have already received the update and are experiencing crashing, please delete the app and redownload it from the Google Play Store- you will be served the previous version. Sorry for the inconvenience! Previous versions of the app displayed more date information than you probably cared to see, all the way down to the microsecond that the call came in. This caused more clutter than necessary, so we’ve switched to using friendlier date formats. For more recent calls, you’ll see relative dates like “Today”, “Yesterday”, or the day of the week. If a call is a few days old, you’ll see the full date. In either case, you’ll always see the time of the call, but no more microseconds. We apologize in advance to all microsecond enthusiasts. If you’re the type of person that keeps a long call log, it can be pretty tedious to navigate back to the top of the list once you’ve gotten close to the bottom. No more. Just tap on the app’s title bar and back to the top you go. In order to reduce clutter, Reverse Lookup has never listed duplicate calls from the same number. This was great for keeping a tidy list, but we’ve come to discover that identifying nuisance calls is easier when you can see how many times a number is calling. 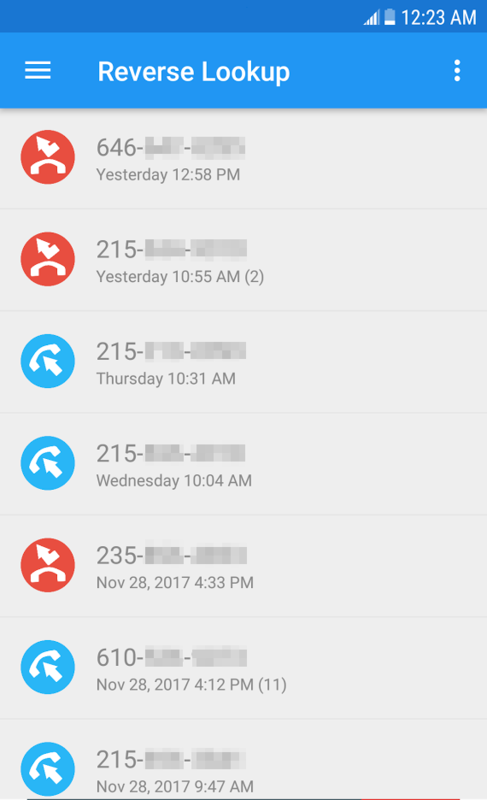 The app will still only list each caller once, but now you’ll see an indicator that shows the number of times their number is listed in your call log. This will be displayed next to the call date(if applicable). Depending on the speed of your phone, this change may be less noticeable, but the main call log screen is now loaded more efficiently, which should provide for a smoother launch of the app. The refresh function also benefits from this improvement. That’s all for this version, and we’re rolling out starting now on the Google Play Store. This will be a slow rollout, so please look forward to receiving it within the next 2 weeks or so. As always, thank you to all of our users. Your continued support makes these updates possible, and for that we’re extremely grateful. The latest version of Reverse Lookup, 3.1.20 is now at 100% distribution through the Google Play Store. All users should be able to grab the update within the next few hours. This rollout began a few days ago, so if you’ve received an update earlier this week, you’re probably already running the latest version. This release fixes a few bugs and further improves search results. Reverse Lookup PLUS is expected to receive it’s equivalent update within the next few days. Thanks, and please shoot us an email if you have any issues or questions. Just a quick note to let everyone know that the previously announced update for Reverse Lookup is now going live for all users, so if you have not received the update in the past couple weeks, you should see it available on the Play Store starting in the next few hours. We’re also going to be releasing a followup update in the next 2 weeks to further improve search results. PLUS users will receive both updates rolled into one on both Google Play and Amazon Appstore. Stay tuned for updates on this next update, and as usual please let us know if you have any questions. UPDATE: The issue has been resolved and an update is now available in the Play Store. We’re aware of an issue that is currently causing Reverse Lookup and Reverse Lookup PLUS to return a small amount of search results with garbled information. We are working to resolve the issue as soon as possible. We apologize for any inconvenience and will update when the issues are resolved. The latest file size reducing update has been rolled out for Christmas Catch. Head over to the Play Store today and get ready for Christmas a little early this year! As promised, we march along updating all of our existing game titles, and today the honor belongs to Sin City Video Poker. As with the recent update to Colordu, this release significantly reduces the space requirements for the game, so head on over to the Play Store and grab it today!